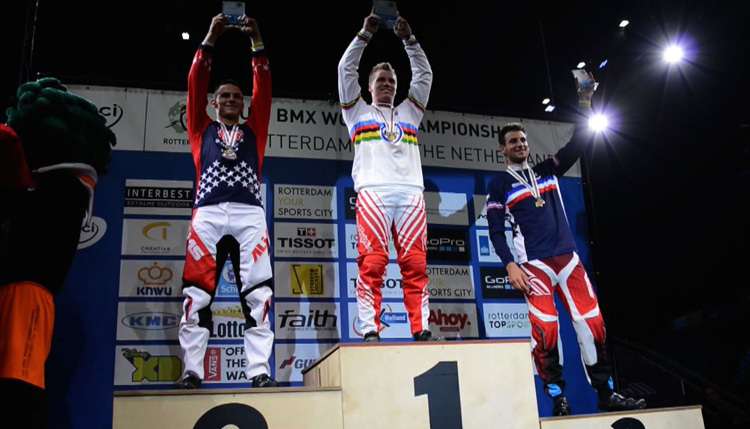 Day 1 of the UCI World Championship titles in Rotterdam, Holland was the running of the Super Finals Time Trail event for the World Title. Connor Fields had won this event for the past 2 years, but after the riders first run in the TT, it was Joris Daudet that held a slight lead in the timed result, being the fastest of the 95 riders that enterd the event. The Super Final format reset the clock, with the riders getting a 2nd chance on the track for the World Title. This time, Connor had a slight bobble that would hold him back to 7th overall in the days competition. Joris rode string, but one minor mistake would also cost him a shot at the Gold medal, but he finished up with the 3rd fastest time at the end of the night. Sam Willoughby captured the World TT Championship, with Corben Sharrah also just edging out Joris for Silver. The riders take to the race track today in Rotterdam, and you can catch it live on www.Redbull.tv or the UCI You Tube Channel.